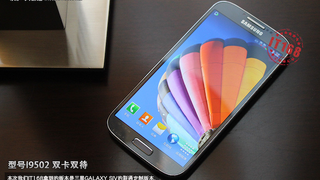 We've seen pictures and video of the Samsung Galaxy S IV already but we haven't seen it like this. In what's probably the clearest pictures of the S IV until it's announced later today, we get to see what the powerful beast of a phone will look like in all its glory. Chinese site IT168 are the ones who got their hands on the phone and listed the specs: 1080p 4.99-inch screen. 1.8GHz 8-core chip. 2GB RAM. 16GB storage. MicroSD slot. 2600mAh battery. And only 7.7mm thick and 138 grams heavy.